“RANGE”…this is the one word that can best summarize our instruction for our blocking and bunt pop skills. As a catcher, I was blessed to play at a high level and I never heard the words “excellent range,” or “way to cover ground JD.” That is not a knock on my agility or quickness, but those phrases (for some reason) don’t seem to apply to catchers in mainstream baseball. To this day, I have vivid memories of making sliding catches against the backstop and blocking pitches in the open batters box that should be considered “plus range.” So let’s consider it and add it into how we work as catchers. Why not? Every other position on the field has elements of range when players are being identified, except maybe a pitcher. At some point even a pitcher will hold back his team or help his team by his range off the mound. All other defensive players get many opportunities to show their range simply by leaving their feet to make a play. To the average baseball spectator, this highlight play is exciting although it doesn’t necessarily mean that the defender has good range. Us catchers rarely have the luxury of leaving our feet to make a play to show our range, mostly because the action happens much closer to us and much more quickly than a ground ball, line drive or fly ball. I strongly feel that as we evaluate catchers on their range, we must look at the distance they are covering when they make a play look routine. The routine-ness of the play is the catchers’ technique in action, when the play is stretching the bounds of reaction and quickness. So when we see a catcher block a ball in the middle of the open batters box and the ball is deadened right in front of him, our jaws should drop as fans, even though the catcher may have made the block look like just another blocked ball. The same is true on bunt plays and bunt pops. The three areas that help a catcher have good range are his athleticism or body-type, his skill, and his ability to anticipate plays. With most other positions all three are pre-requisites. The first area, athleticism, can be over-valued as a catcher, but will be the difference between good range and exceptional range. Our focus during training is partly on strengthening their legs, but the bulk of our instruction is to bring awareness to their skill, footwork, and anticipation of plays. We did tremendous work on the mental side of range with the expectation that when hard-to-reach dirt balls are thrown, they are ready for them, and the catcher can make it appear like a “routine” block. Anticipate and you will get there. You see, the phrase “exceptional range,” “good range,” or even “the routine-play” for that matter, is a relative term. It is relative to how you/we define it. As a college catcher, I was taught to redefine “routine” for myself and to redefine my standard as a catcher. As I matured and my desire to be great grew, I understood that the average to good catcher was able to block most balls in front and about two feet laterally. This challenged me to change my standard and my new expectation became to block everything three feet laterally and even to reach beyond that. The only way I could accomplish this goal was to continuously practice blocking dirt balls with anticipation that they would be beyond average reach. 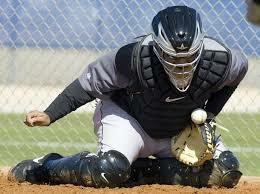 With proper training, practice, and the correct mental approach, catchers can take their range to the next level.